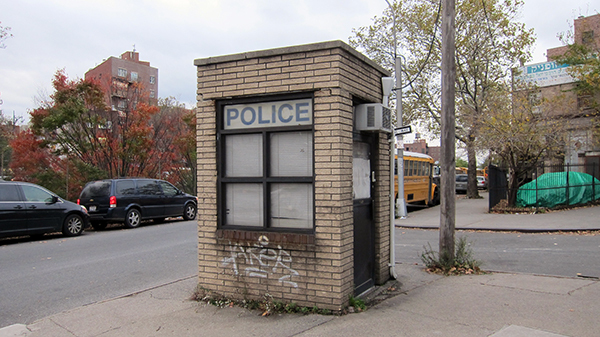 Frankie's Apartment: The Williamsburg Police Station Is A Bit Small, No? The Williamsburg Police Station Is A Bit Small, No? Williamsburg. He carries a shrink-ray instead of a glock and keeps all the robbers in bird-cages. wears a thimble as a hat that he painted black so he looks like a keystone cop (but also a Hasidic guy). He's actually standing right there in the weeds under the AKER tag, but he's so small you can't see him. Got bagged out in willy-B once, ended up in this joint. Birdcages AND hamster cages are the holding cells. What'd you get popped for? C'mon Frankie, what Pecos got pooped for is his own personal business. Speaking of personal business and speaking of police officers... where are those dozen powdered donuts you promised me? I kept my end of the bargain and remember no one likes a welcher, except maybe me.